I’ve only knit on 3 in 1 for the past week. 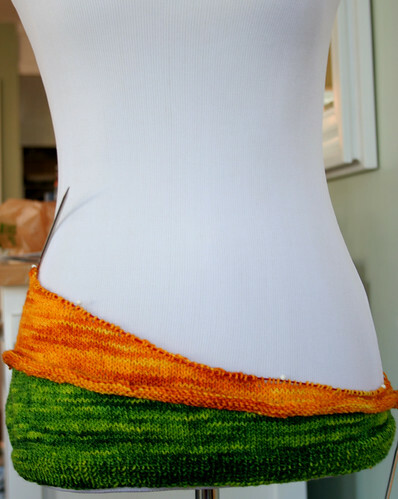 I momentarily dreamed of some garter stitch but that was fleeting. I want to wear this top. Now. Right now. Last week I talked about the 2 color options I had – orange in the middle or the bottom. I decided on the middle. I did the Very Stretchy Cast On (wish there was a more unique name) and while it was painful to cast on all those stitches it’s living up to its name and is both very stretchy and very pretty. I love how tonal handdyeds look when they’re cast on. 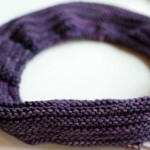 The ribbing worked up surprisingly quick even though it’s on 3.25mm needles. The ChiaoGoo tips really helped speed things along. And bonus – no unsightly striping or flashing. The first section was straightforward too. 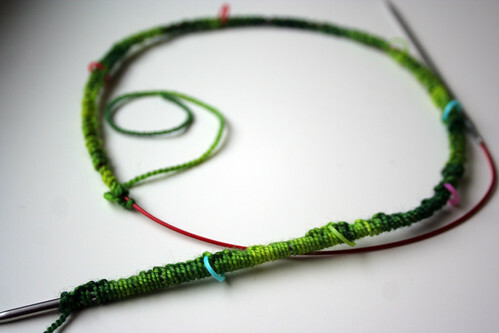 That joining of the second color was a bit fiddly, especially with the intentional purls rolling up into the work. There might have been some cursing. 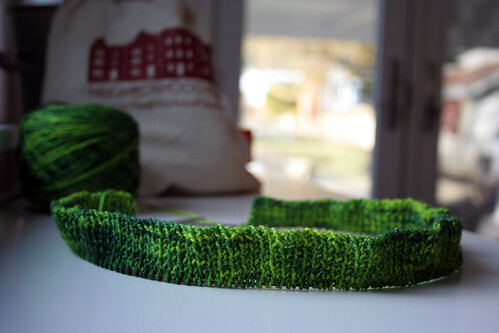 By the time I got to section 2 I knew what to expect with the joining round so it went smoother – it didn’t fly by but I got better at it and don’t think I even raised my voice or grunted (you rate your knitting that way too right?). 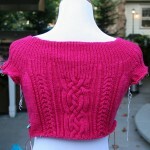 I’m now onto the magenta and can’t wait to get done with these short rows so I can just knit knit knit in the round. Then it will truly be TV knitting – although I did knit on it at the pub a bunch last night so I guess it’s technically already at that point. I know I’m not the only one obsessed with this pattern – the number of projects in Rav has almost doubled since I cast on a week ago. 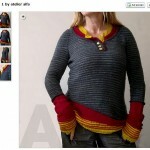 This knitter even went a step further than I did with the color options and mocked up 9 variations to help her decide. It was fun to look through all the different options she had. I’ve already been daydreaming about what to do with all the leftovers I’m going to have. Stripey legwarmers maybe? sweaters, WIPs - 2014 3 in 1, pullover. permalink. Love that the obsession continues. I took a mild detour with my Pomme, but I am back at it again. But no flinging? Some of my projects get rated by how far I’ve flung it across the room. Inevitably, there is someone there to witness my bad behavior. I prefer when that someone is the dog. Also, it sure is glorious when a project can command so much enthusiasm that the knitting is a pleasure! Great color choice! Thanks for the link; that looks like a great cast-on. I am definitely going to try it. 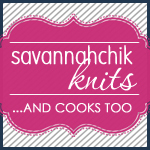 Love seeing how your new project is unfolding … please keep sharing!! I love seeing your progress! 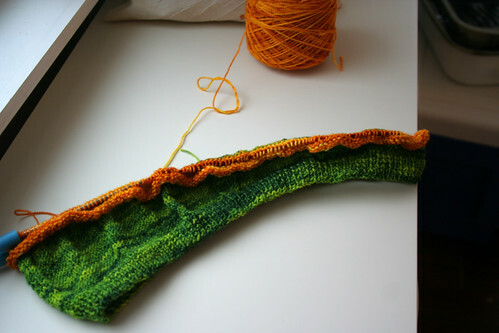 The green and orange are a beautiful combination so far and you are making me want to cast something in vibrant spring colours now! Wow! What an original pattern! Great color choices! 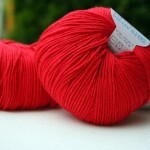 Love your colors and yarn choice, Jody! The mock up looks like fun.